The Executive MBA Program from Mays Business School at Texas A&M University is a rigorous educational program designed for qualified business professionals. Based in The Woodlands, just north of Houston, the two-year program is built on an innovative curriculum that focuses on creating value in your organization. Through peer discussion, case studies, and dynamic interaction with our accomplished faculty, the Executive MBA Program provides our participants with skills and learning they can put to work immediately. Texas A&M's Executive MBA Program is noted for providing great value for our participants, and was rated #1 in the country for return on investment by the Wall Street Journal in December 2008. The EMBA curriculum is delivered in a format designed for working professionals. Unlike typical lecture-driven classrooms, our professors engage participants in a dialogue – challenging them to bring their experiences to the table in a meaningful way. Throughout the Executive MBA program, participants are encouraged to relate current areas of study and discussion to situations within their organization. Not only does this make the program content more relevant, it also provides immediate benefit both to the participant and to individual organizations. Through this dynamic discussion and interaction, our participants learn innovative approaches to problems and opportunities from their peers and our professors. For more information about Mays' Executive MBA (EMBA), please submit an information request below and the school will contact you with further information. Texas A&M's Executive MBA Program is a highly selective program with competitive admissions. To ensure rich classroom and team interactions, our admissions committee looks for demonstrated leadership and academic potential in each candidate. At least ten years of professional work experience with at least seven years of progressive and significant managerial responsibilities is preferred. Managerial experience may include management of people, assets, or other resources. International experience is beneficial, but not required. A baccalaureate degree from an accredited institution recognized by Texas A&M. 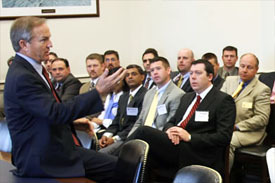 Participants earn the MBA degree from Texas A&M University. All of the degree programs of the Mays Business School at Texas A&M University are accredited by AACSB. Schedule: The program begins with a new class of participants each August. Classes meet Friday and Saturday of alternating weekends 9:00 a.m. to 4:30 p.m. All classes are held at the University Center at Lone Star College in The Woodlands, Texas. Curriculum: Participants complete 45 credit hours covering the major disciplines of business during the program. Length: The program is taught over a two-year period. It requires 18 months of attendance during the fall and spring semesters. No meetings are held during the summer months. By bringing together experienced participants and exceptional faculty, and delivering a curriculum designed specifically for executives, our program provides a significant return on your education investment. Our program has been recognized for its achievement in providing exceptional return on investment for its participants. Most notably, Mays Business School were ranked #1 in the world for Return on Investment of Executive MBA Programs by The Wall Street Journal (December 10, 2008). The cost of the EMBA from Mays, for the class beginning in August 2010 is $72,500 for Texas residents, as determined by Texas A&M University. Seminar fees during the Washington Campus seminar in Washington, D.C.
Transportation costs to attend the program. Fill out your details to find out more about Mays' Executive MBA (EMBA).